Background: Considering that ethnicity and gestational age (GA) could affect the value of nuchal fold thickness (NFT) in mid-trimester, we aimed to determine the reference intervals of NFT values for each gestational week from 16 to 24 weeks of pregnancy among a group of Iranian pregnant women. Materials and Methods: In this cross-sectional study, medical files of pregnant women who underwent fetal anomaly scanning at 16–24 weeks of gestation were reviewed and the following data were extracted: GA, value of NFT, value of nuchal translucency (NT) in their previous ultrasound study, if available, and head circumference (HC). The 5th, 25th, 50th, 75th, and 95th percentiles of NFT for each gestational week were determined. The association between NFT and HC, GA, and NT were also determined. Results: Medical files of 882 pregnant women were studied. The expected 95th percentile value of NFT between 16th and 24th weeks of gestation ranged from 4 mm to 5.9 mm. The mean (standard deviation) of NFT increased with GA from 2.67 (0.90) mm at 16th weeks to 4.69 (0.71) mm at 24th weeks. There was a significant positive association between NFT and GA (β = 1.11, p < 0.001), HC (β = 0.21, p < 0.001), and NT (β = 0.351, p < 0.001). Conclusion: The findings of this study revealed that before the 20th week of gestation, the appropriate cutoff value of NFT is 5 mm, and for 21st to 24th weeks, the proper cutoff is 6 mm. However, for providing more conclusive results, further studies with larger sample size and considering the impact of other influencing variables are recommended. Background: Increased levels of reactive oxygen species is a key factor involved in the pathogenesis of type 2 diabetes mellitus (T2DM). Coenzyme Q10(CoQ10) is a nonenzymatic antioxidant that restores other antioxidants. 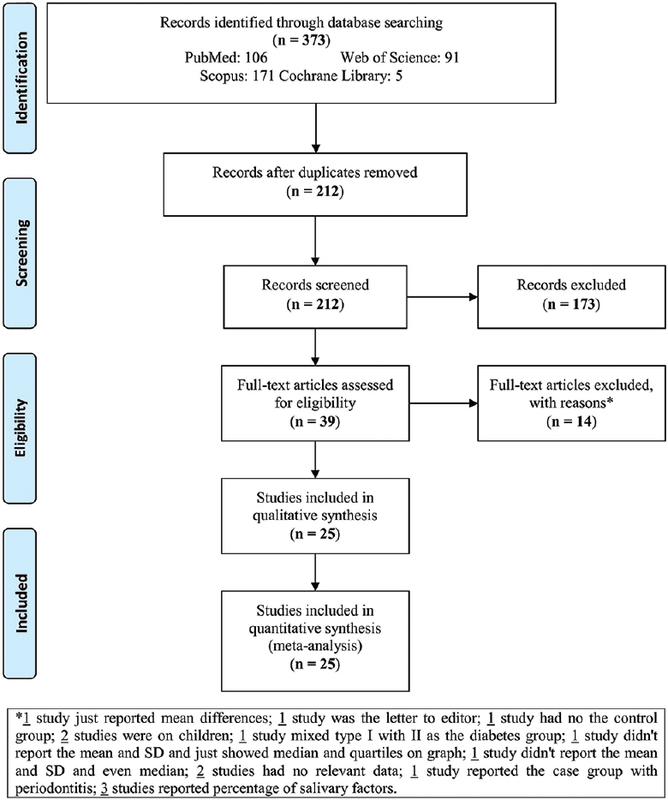 Materials and Methods: This randomized, double-blind placebo-controlled trial study has been designed to evaluate the effects of CoQ10supplementation on serum values of amylase, adenosine deaminase, catalase (CAT), total antioxidant capacity (TAC) and the quantitative insulin sensitivity check index (QUICKI) in women with T2DM. Serum levels of CoQ10were measured too. Sixty-eight women with T2DM were enrolled in this study and randomly divided into two groups. One group received 100 mg/day of CoQ10supplement for 12 weeks (n = 34), and the other group was given placebo for the same time duration and dosage (n = 34). Results: After the intervention, serum CAT activity (P < 0.001), TAC (P = 0.006), CoQ10(P = 0.001), and QUICKI (P = 0.005) increased and fasting blood sugar (FBS) (P = 0.05) decreased significantly in CoQ10group. Conclusion: This study showed that daily supplementation with 100 mg of CoQ10could increase TAC and CAT activity as, CoQ10and QUICKI and could reduce oxidative stress and FBS in women with T2DM. Original Article: Is neutrophil gelatinase-associated lipocalin a good diagnostic marker for renal injury in asphyxiated preterm infants? Background: The objective of this study is to evaluate the value of neutrophil gelatinase-associated lipocalin (NGAL) for becoming a good endogenous marker of renal function in asphyxial preterm babies. Materials and Methods: This is a two-center retrospective study. Between October 2016 and October 2017, 71 asphyxial preterm infants were included in asphyxia group. Seventy babies were randomly included in control group. Samples were tested at 24, 48, and 96 h after birth. Quantitative data were compared by independent sample t-test or repeated measures ANOVA. For qualitative data, Pearson's Chi-squared test was performed. 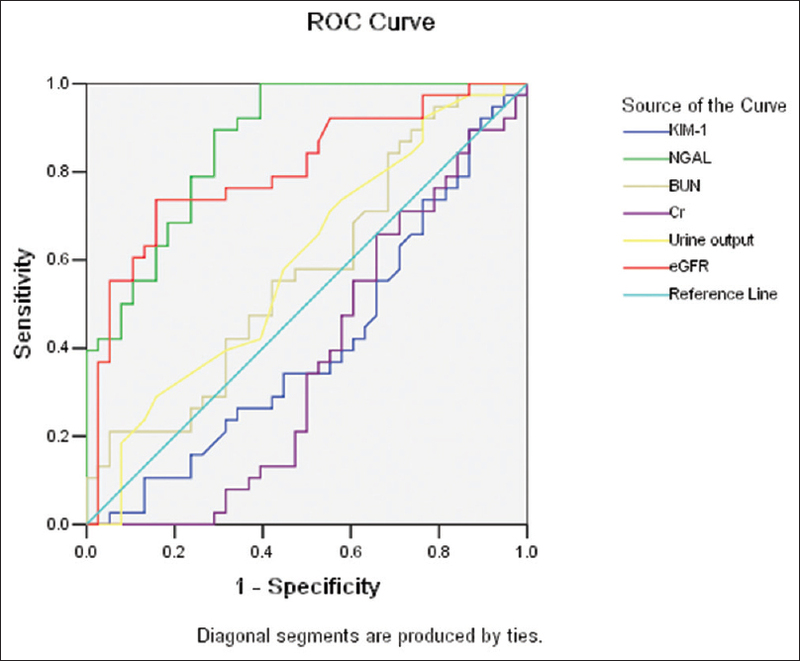 Draw ROC and compare the area under the curve (AUC), 95% confidence interval for AUC, specificity (Spe), sensitivity (Sen), and Youden index (Sen+Spe-1) at 24-h, 48-h, and 96-h time points. Results: (1) There are no significant differences concerning on baseline data. However, blood gas, Apgar score, and resuscitation showed a significant difference (P < 0.05). (2) In 24-h samples, only uNGAL and estimated glomerular filtration rate (eGFR) showed differences between the two groups (P < 0.05). In 48-h samples, significant differences could be found in uKIM-1, uNGAL, blood urea nitrogen, and eGFR (P < 0.05). In 96-h samples, almost all indicators have significant differences except urine output and eGFR (P < 0.05). (3) All biomarkers showed statistical difference in the three time points (P < 0.05), but only uNGAL showed a downward trend after the increase of expression. (4) uNGAL has better Sen and Spe than other indicators (24-h AUC 0.870, Youden index 0.606; 48-h AUC 0.879, Youden index 0.692; and 96-h AUC 0.806, Youden index 0.606). Conclusion: uNGAL has a better distinguishability in asphyxial neonates compared with other indicators. Certainly, a larger sample, prospective study is still needed. Background: Saliva is a fluid with the complex compound which can be used as diagnostic markers for type 2 diabetes (T2D). This meta-analysis evaluated salivary glucose, immunoglobulin A (IgA), total protein, and amylase levels in adult T2D compared with the controls as well as the correlation of salivary glucose levels with serum glucose and hemoglobin A1C (HbA1c) levels in both groups. Materials and Methods: Web of Science, Scopus, PubMed, and Cochrane Library databases were searched up to July 2017. A random-effects analysis was performed using the mean difference (MD) and 95% confidence intervals . The search terms were “T2D, IgA, amylase, total protein, or glucose” combination with “saliva.” The studied variables were the sample size, the percentage of male, the mean age, the condition of saliva sampling, and the salivary levels of mentioned factors. Results: A total of 25 studies were included in this meta-analysis with 1432 and 900 diabetic patients and healthy controls, respectively. MD of salivary glucose level in patients with T2D, compared with the healthy controls, in fasting and nonfasting conditions were 6.23 mg/dL (P = 0.0002) and 6.70 mg/dL (P < 0.00001), respectively. Furthermore, the fasting salivary total protein in the patients was significantly higher than the controls (MD = 167.96 mg/dL; p = 0.03). Non-fasting salivary amylase and secretory IgA levels were significantly lower in the patients (MD = −48.61 IU/mL; p < 0.00001) than in the controls (MD = −9.42 IU/mL; p = 0.0006), respectively. The pooled estimate showed a significant correlation between salivary and serum glucose in the patients (r = 0.765; p < 0.001) and the controls (r = 0.646; p < 0.001) and between salivary glucose and serum glycated hemoglobin in the patients (r = 0.721; p < 0.001). Conclusion: Measurement of these salivary factors can be helpful for diagnostic and monitoring purposes of T2D. In addition, salivary glucose as a diagnostic tool can evaluate serum glucose and HbA1c levels in the diabetic patients. Background: Hepatitis C virus (HCV) infections remain as one of the major public health problems worldwide. The current study aimed at investigating the potential risk factors of HCV+ in a sample of Iranian patients. Materials and Methods: In a case–control study, 436 HCV-infected patients and 531 age-matched HCV antibody negative controls were recruited in a central region of Iran. Sociodemographic characteristics, blood and therapeutic factors, underlying diseases, and behavioral risk factors were evaluated through a standard checklist and compared between two study groups. Results: Although among studied potential risk factors, many of them were significantly associated with infected with HCV; however, in multivariable logistic regression model in the presence of other variables being male gender (odds ratio [OR]: 4.1; 95% confidence interval [CI]: 2.2–7.8), illiterate or less educated (OR: 62.64; 95% CI: 5.94–660.35), having history of intravenous (IV) drug addiction (OR: 33.0; 95% CI: 5.43–250.0), and tattooing (OR: 14.29; 95% CI: 1.82–90.91) increased risk of infection with HCV. Conclusion: In total, the current case–control study documented that socioecomical factors including economical state, marital status, education, and ethnicity and also other expected factors such as hospitalization, imprisonment, dialysis, tattooing, needle sharing, IV drug abuse, and extramarital sexual relationship represent an important source of HCV infection among adults in a central region of Iran. Thus, we suggest further considerations for prevention of HCV infection as most of related factors are preventable by close considerations. Bullhorn injury is a rare mechanism causing traumatic abdominal wall hernia (TAWH). Bullhorn injury needs to be discussed as a separate sub-entity among TAWHs as the mechanism of injury is such that the great force is generated at a relatively small area of impact for a short duration of time which may lead to muscle defect without compromising integrity of overlying skin (referred to as sheathed goring) leading to herniation of abdominal viscera. The purpose of this review was to discuss abdominal herniation's associated with bullhorn injury as a separate entity from TAWHs; recognize the common presentations, mechanism of injury, and modalities of treatment currently utilized for this rare condition. A comprehensive online English, Spanish, Portuguese, and French language medical literature search was done using various electronic search databases. Different search terms including MeSH related to bullhorn-injury associated injuries including abdominal wall hernias were used. An advanced search was further conducted by combining all the search fields in abstracts, keywords, and titles. We summarized the data from the searched articles and found 12 cases who underwent emergency or elective herniorrhaphy with or without the use of mesh. We have proposed a treatment algorithm for such cases in light of the present era of laparoscopy and propose the usage of the term “bullhorn-injury associated traumatic hernia” for such cases. We present here the first most comprehensive discussion of all such cases reported till date.